Last month Free I.T. staff members “test drove” new hours on Saturday mornings. I’m happy to report that it was a success! Not only did people come out to shop, get tech support, and donate, but volunteers started showing up too. So we decided to put the new hours permanently on the schedule: Free I.T. 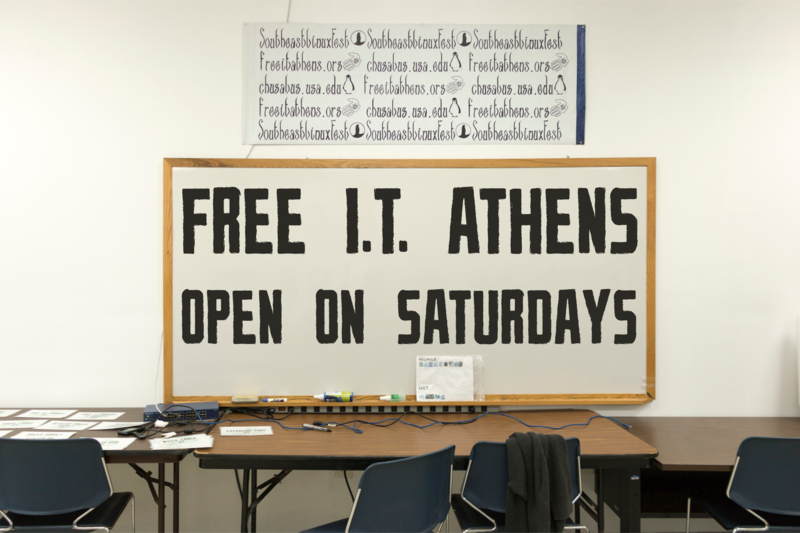 Athens will now be open on Saturdays from 9a – 1p. Volunteer: learn about technology, protect the environment, and help the Athens community in a cooperative hands on environment. Donate: drop off those electronics you’ve been hoarding since 1992! We’ll either put them to good use or ensure that they’re recycled responsibly. Shop: Computers for $15, monitors starting at $15, printers for $10, $1 cables… we even have a record player in the store! Tech Support: bring in your ailing computer or laptop and let Free I.T. folks help you fix it! This month Franklin College is hosting a networking, movie screening, and panel discussion all about the gender gap in the software industry. We’re giving the event a shout out because it aligns with our mission to bridge the digital divide! See you in the workspace!